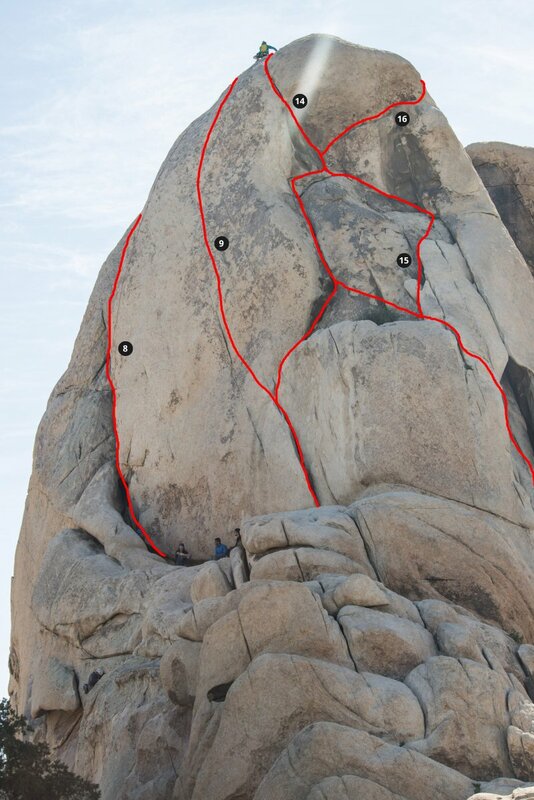 Located in the heart of Joshua Tree National Park, Intersection Rock is a prominent 150-foot tall monzonite monolith that is distinctly recognized as the birthplace of climbing in Joshua Tree. Joshua Tree was popular among climbers through the 1950s and 1960s, but it was considered a practice area for "better" climbing areas sprinkled through out the U.S. West and in California itself. All changed in 1968, when Tom Higgins, a Yosemite regular, ventured into Joshua Tree and made a first ascent up what is now known as Left Ski Track. 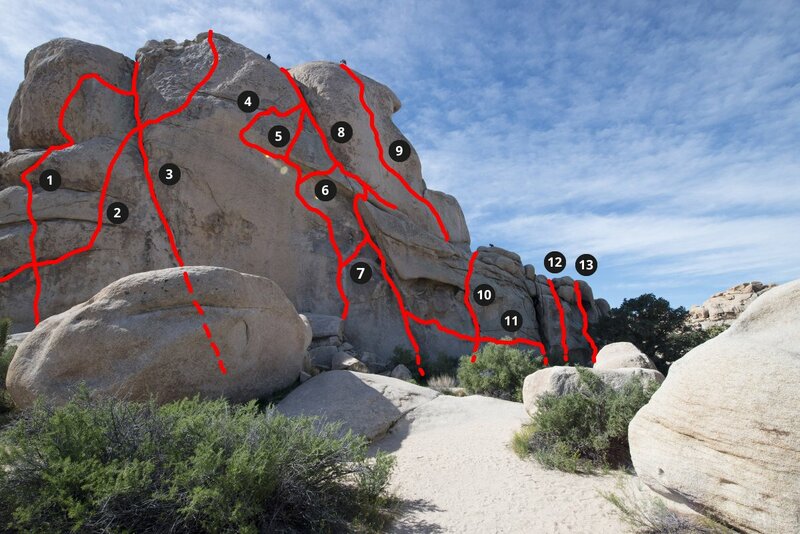 The route had far more vertical rise and was more technical than anything that had been summited in Joshua Tree. The first climber's guidebook was published in 1970, co-authored by John Wolfe, member of a group of climbers known as the Desert Rats. According to the National Park Service, this book started a climbing tradition: "Classic lines like Intersection Rock's North Overhang, Upper Ski Track and Left Ski Track were made widely known, and the Joshua Tree climbing boom began." Today, Joshua Tree National Park is just as synonymous with rock climbing as Yosemite National Park, albeit quite different in nature. It is difficult to deny how mythical Joshua Tree has become among climbers. So, whether you've climbed Intersection Rock for years, or this is your first time visiting the monolith and park itself, it is worth a pause to acknowledge the significance of Intersection Rock. As the National Parks Service says, it "marks an intersection in climbing history." ​Note: Power drilling for bolt placement is strictly prohibited without a permit. Bolts must be 3/8" or 1/2" stainless steel. All hangers and anchors must be colored to match rock. Routes on the north face of Intersection Rock. 1. Kool Aid: 5.10d A4, 150 ft.
2. Ignorant Photons from Pluto: 5.11a, 150 ft.
8. Upper Right Ski Track: 5.3, 70 ft.. Lower Right Ski Track: 5.10b, 70 ft.
11. Intersection Traverse, V1, 30 ft.
12. Knuckle Cracker, V0, 20 ft.
13. Reider Problem, V4, 20 ft. 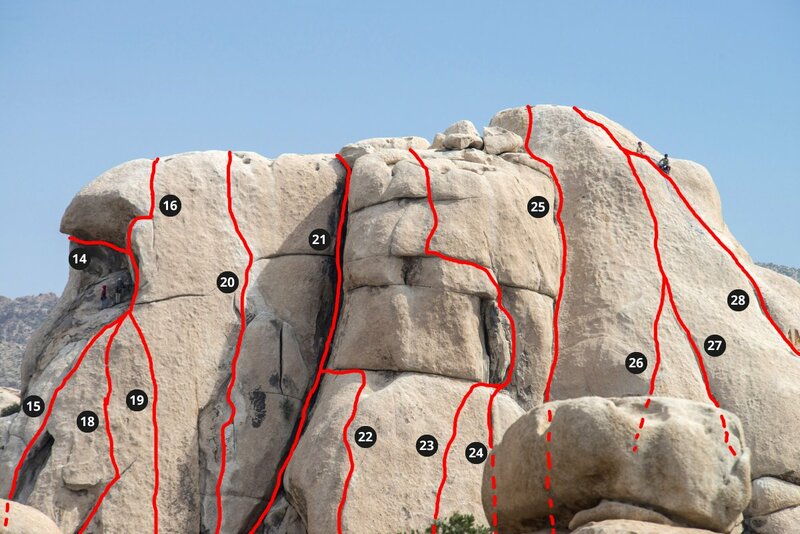 Routes on the west face of Intersection Rock. 15. Underpass: 5.6, 120 ft. Routes on the south face of Intersection Rock. 18. Overpass: 5.6, 120 ft.
21. West Chimney: 5.6, 150 ft.
22. Shovlin-Cole: 5.10b, 160 ft.
23. Billabong: 5.10c, 160 ft.
25. Bat Crack: 5.5, 160 ft.
26. Pinnacle Stand: 5.7, 160 ft. Very heavily used. Intense afternoon heat and sun exposure.